A Precious Metals IRA, also sometimes called a Gold IRA, gives you the opportunity to hold a variety of alternative assets, including precious metals like gold. However, not all gold bars and coins are eligible to be used as investments in an IRA, as the Internal Revenue Service (IRS) has set forth very specific requirements and purity standards regarding the types of gold allowed an IRA. In fact, there are numerous gold bars and coins that cannot be deposited into a Gold IRA because don't meet the minimum purity requirements mandated by the IRS. To be eligible for IRA investing, a gold bullion product must meet the minimum purity requirement for IRA gold, which is set at 0.995-pure. In other words, a gold coin or bar must be at least 0.995% pure to be deposited into an IRA. The gold being deposited into the IRA must be stored in an approved depository. A depository is a highly secure precious metals storage facility. Only certain depositories have been approved by the IRS to hold IRA gold. Most bullion dealers and brokers will have one or more preferred depositories. American Gold Eagles – The American Gold Eagle is 91.67 pure, but the coin itself weighs 1.0909 troy ounce, so the coin still contains 1 troy ounce in gold. American Gold Buffaloes – These coins were the first 1 oz .9999-gold coin released by the United States Mint in 2006. The Gold Buffaloes quickly proved to be considerable competition for their Canadian Maple Leaf counterpart. Australian Gold Kangaroos – These coins were introduced in 1987 by Gold Corp, a company that is entirely owned by the Western Australian Government. Gold Kangaroo coins are considered legal tender in Australia and have remained a popular investment and collector's item during the past two and a half decades. Austrian Gold Philharmonic – This coin is known for its classic Musicverein design, which includes a symphony of common instruments like the cello, harp, violin, bassoon and french horn. Canadian Gold Maple Leafs – The purity and weight of Canadian Gold Maple Leafs are guaranteed by the Royal Canadian Mint. These coins are typically sold in packs of 10 in mint tubes. Canadian War of 1812 Gold Coins – The Royal Canadian Mint guarantees both the weight and purity of these extremely limited editions commemorative coins issued on the bicentennial of the War of 1812. These coins come in sheets of 20 directly from the Royal Canadian Mint or in singles. Credit Suisse Gold Bars – These bars are minted by the prestigious Credit Suisse mint headquartered in Zurich, Switzerland. All Credit Suisse bars meet minimum purity levels of 99.99%. Johnson Matthey Gold Bar – Althose these bars are less frequentyl availablefor sale than some of the other popular gold bullion bars, Johnson Matthew bars come in a variety of denominations and are industry-renowned as some of the finest gold bars money can buy. Johnson Matthey gold bars are guaranteed to meet a.9999-fine gold purity level. Valcambi Gold CombiBar – These “divisible” bars consist of 0.999% pure gold and provide the distinct advantage of being split into 50 easily detachable 1 gram mini bars. In addition to the above coins, avoid all commemoratives, numismatics, and collector's coins. These coins are sold at unnecessarily high premiums and are not intended to be used as investments. Be aware that some sales reps will try to persuade you into buying these “rare,” “special,” and “limited edition” coins. In reality they are overpriced and very few of them will ever be worth more than the price they were bought for. Investing in gold within a precious metals IRA can be advantageous for the retirement investor in multiple ways. First, the account is not dollar-backed like a 401k or other type of retirement account, so the ongoing depreciation of the dollar will not detrimentally affect the value of the gold held in your IRA. In fact, when the dollar loses value this causes many investors to turn to gold and other precious metals as a means to store their wealth in a medium that will not depreciate. When this happens the demand for gold increases, thereby causing the price to rise as well. 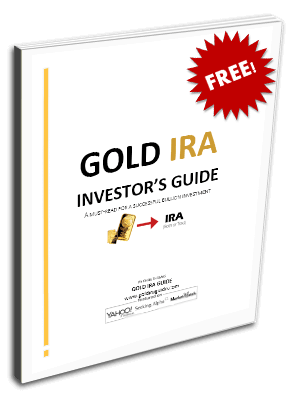 Gold IRA investors intrinsically benefits from this clear and consistent correlation – as the value of the dollar decreases, the value of gold increases. In addition to protecting a portion of your retirement wealth from the devaluing effects of inflation on paper currencies, investing in gold within an IRA also gives you the opportunity to earn a substantial return on your investment in the long-term. With some analysts speculating that gold could reach $5000 per ounce within the next decade, and mining companies estimating that all of the discovered gold deposits on Earth will be mined within the next 20 years, now could be one of the best times in history to hold gold as an asset and retirement investment.